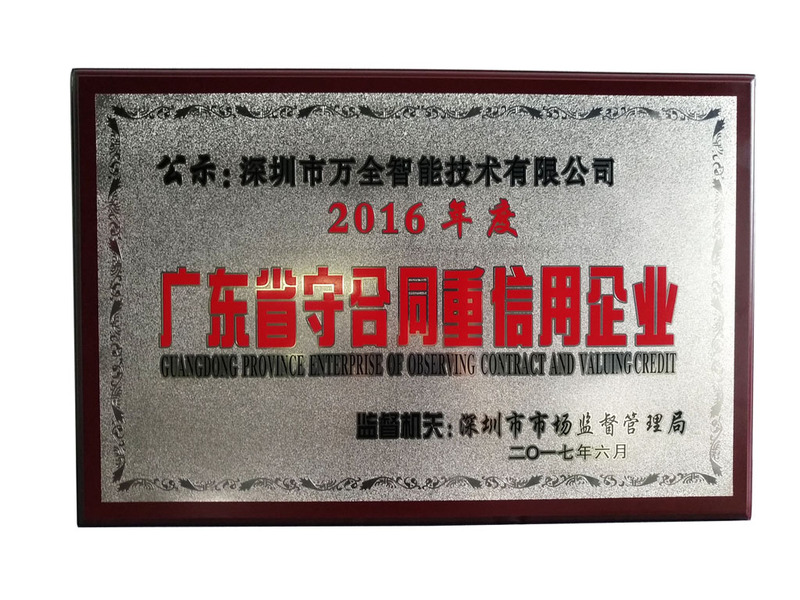 Vanch Intelligent was award 2016 GuangDong Province enterprise of observing contract and valuing credit. Definition: The reputation of observing contract and valuing credit of Guangdong province is mean that Enterprise publicity activities refers to the administrative department for Industry and Commerce in accordance with the provisions of relevant laws and regulations, in accordance with enterprise applications, an annual contract to meet the conditions of the enterprise publicity signing contract information and other credit supervision information, give publicity to the community through the "online publicity system of Guangdong Provincial Administration for Industry and Commerce of the contract Shou Credit Enterprises behavior. In the begin of founding the company, the company leader was put the business credit on first place, completed seriously the contract law and relative laws and regulation. Keeping the operated idea of credit first, and to be honest and trustworthy. In June of this year, our company have achieved the reputation of observing contract and valuing credit, which promote our enterprise’s reputation and improve market competition. Company leader always focused on observing contract and valuing credit this line and make it as a important job, financial department, operation Department, sales department, R & D department and other regulatory personnel put into place and make Standardize contract management as a very important part of observing contract and valuing credit, think contract management as the life and wealth of a company, and honesty and trustworthiness as the base of company development. In order to keep observing contract and valuing credit this activity orderly, the first we done is completed organization, clear the duty and responsibilities. Establish and improve the rules and regulations, especially we also adjust and revise the contract management system suitable for the enterprise and the industry in accordance with the relevant provisions of the contract law.Make the contract management so that the people responsible, well documented, rule-based, enterprise credit management level has been significantly improved. When signed the contract , the company uses the contract model text, strict specification, complete terms, complete contract, complete the contract information in accordance with the provisions of the filing, and safekeeping. In the operation, we consciously accept the supervision and administration of the administrative departments for Industry and Commerce and the industry supervision departments, abide by the law and abide by the law, honest and credit, and do not happen any illegal acts and bad records. Due to company pay attention to the importance of contract in the enterprise in economic work, in the performance of the contract for the initiative, achievement effect is significant, since the emergence of a contract dispute, the contract signed, the terms of foreign specific clear and complete procedures, clear responsibility, and in accordance with the contract to fulfill, the contract rate reached 100%. By strengthening contract management and safeguarding its legitimate rights and interests, the management level of the company has also been improved, and achieved better economic and social benefits.